Dubbed as the original and best for over 50 years, McVities Jamaica Ginger Cake is a moist, sweet loaf cake with a delicious ginger ‘kick’ that is guaranteed to delight the taste buds. A loaf of this cake can be cut into 10 slices, each one containing 93 calories. This popular snack is perfect either on its own or with a layer of butter or margarine – and, of course, accompanied with a nice cup of tea. Most popular with customers in France, United States of America (USA), Italy, Canada, Spain, Germany, Netherlands, Greece and Sweden, but you can buy McVities Jamaica Ginger Cake for delivery worldwide. 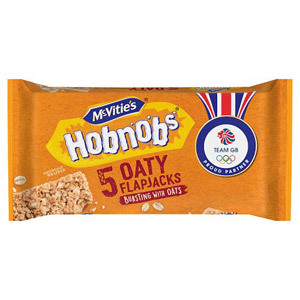 One of our McVities branded products. Contains Eggs, Contains Milk, May Contain Mustard, May Contain Nuts, May Contain Peanuts, May Contain Soya, Contains Wheat. Glucose-Fructose Syrup, Flour (Wheat Flour, Calcium, Iron, Niacin, Thiamin), Water, Sugar, Vegetable Oils (Palm Rapeseed), Humectant (Sorbitol), Emulsifier (E471), Dried Whey (Milk), Colour (Plain Caramel), Milk Protein, Wheat Starch, Raising Agent (Sodium Bicarbonate), Stabiliser (Guar Gum), Dried Whole Egg, Wheat Protein , Salt, Preservative (Potassium Sorbate), Ginger Flavouring. Store in a cool, dry place. Once opened, store in an airtight container. For best before, see side of pack. This McVities Jamaican Ginger Cake is the best ginger cake I've ever bought or made. I've tried several recipes to try to get the same taste and texture and not even come close. The key to why I think this is the best is that is very moist and perfectly sticky. Even after keeping the packet in the cupboard for weeks it still has the same great stickiness to the top layer. The ginger flavouring is just right. It says that it can be cut into ten slices which I think is not really true. Its more like 6 good slices, or 8 if you want to make it go further. I usually enjoy it with a cup of tea but I think it would also be nice warm with custard as a dessert. I'm a giant Ginger fan! So is my hubby and son. So I thought this bread might be a real treat. Indeed it was! We're all hopelessly addicted. The Bread is very moist and carries a lovely level of Proper Ginger flavor. Not overpowering but just the right amount, so that one can really taste it. Putting 2 of these on my next order! I have to say I was rather disappointed with this ginger cake. It wasn't at all as I remembered it. The cake seemed more like a light sponge with a hint of ginger than a really sticky cake that had lots of ginger in it. I think it's expensive for what it is as the cake isn't very big or deep. It was okay with a cup of tea in the afternoon but nothing special. It's a shame as I was looking forward to this treat but I don't think I will order it again. 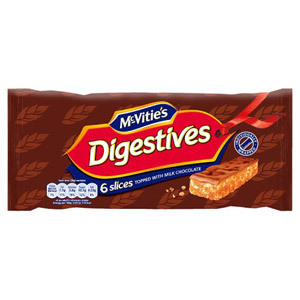 McVities Jamaica Ginger Cake is a delicious and nicely textured cake. I have always loved products with the true taste of ginger in them and this is the case with McVities Jamaica Ginger Cake. It is not too strong in taste as sometimes is the case when ginger is used but is just perfect! Remarkably tasty ginger cake slightly sticky, but definitely more of a cake than a sticky pudding. Nice ginger flavour, tastes very fresh. I have already bought again. My ginger craving has finally been fulfilled. 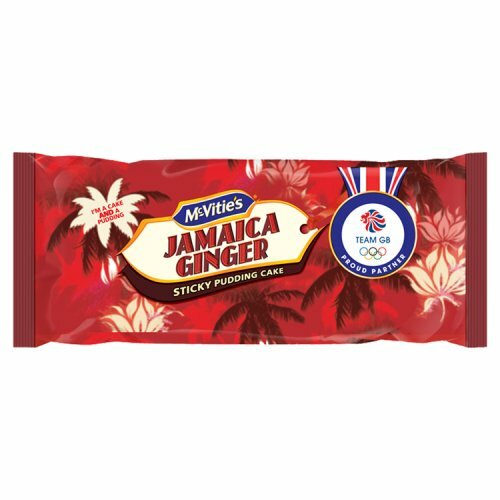 McVities Jamaica Ginger is a perfectly spiced, moist, tender and sticky cake. It goes perfect with tea or coffee. I absolutely love the taste of ginger and it is hard to find quality foods that the ginger is the star. 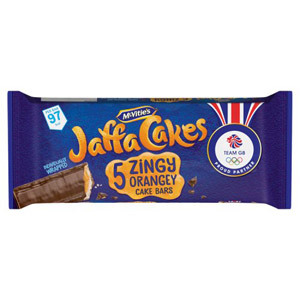 McVities wins this one hands down! This will be in constant stock in my house. You can't go wrong if you enjoy a strong ginger taste. This puts any gingerbread to shame. Very soft and moist - perfect for an afternoon snack along with a decent cup of tea. 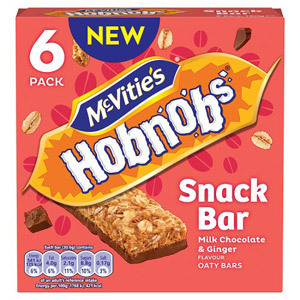 McVities do this flavor particularly well and it's got just the right level of gingeriness about it - being not so feeble as to be virtually tasteless and not so strong as to leave you gasping for breath afterwards. We tend to buy a batch of these and then bung them in the freezer for consumption at a later date. The cakes are robust enough so that they don't suffer a jot as a result. 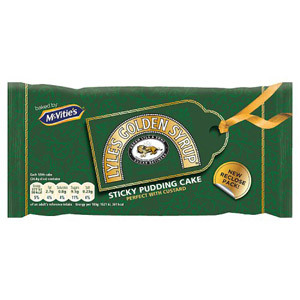 Try McVities ginger cake with custard (hot or cold) for a delicious pudding. Delicious soft and springy cake. Just enough ginger to be really tasty without being overpowering. Great in a bowl with custard of course, but also rather nice sliced thinly on a plate, with a thin smear of butter. It's compact regular dimensions make it easy to store in the cupboard or freezer and once defrosted it still tastes fine to me! This ginger cake is delicious, you can taste the undertones of ginger and other spices. It is soft and moist and can be enjoyed either cold or warm with custard or whipped cream. Though it is rather unlikely that you will have any cake left over, if you do, it freezes really well. My son recently celebrated his 30th birthday and as he lives in a different province I could not bake a cake for him so I ordered two of these ginger cakes in my last order and sent one for him. He was thrilled and very grateful as he too loves this cake. On trips back to the UK I always try and stock up on Spiced Jamaica Ginger Cake. It keeps well, travels well and is a delicious snack with afternoon tea! I really really want to find a good recipe so I can make my own - I have tried a few times but it doesn't taste like the real thing. So it is nice that I can just order it on British Corner Shop - thanks so much for stocking it. No import shops locally carry it! A great, compact cake that serves as a snack or as a dessert. It is dense, moist and a bit gooey. You can eat it straight out the pack it or warm up a slice in the microwave or under the grill. Not too spicy. I find it a little too sweet for my taste but in small portions it's fine. This cake from McVities is truly delightful. I can not understand how they can always produce great, moist and fluffy cakes. It is great when enjoyed either warm or cold, alone or even with custard. It is so nice it can be enjoyed in any way and at any time of day without feeling guilty. Mc'Vities is the best brand when it comes to fluffly,moist cakes and crumbly and buttery biscuits. I am a big fan of ginger nuts biscuits but sometimes miss the *cake* feel. This is problem solved with Jamaica ginger cake which has a delicate yet fragrant authentic ginger and spices taste. Really moist and soft gingerbread with a good flavour. This is yet another nostalgic reminder of home for someone living abroad and well worth ordering! It goes well on it's own but could also be enjoyed with a layer of butter for an extra treat to accompany anyone's favourite cuppa. This is perhaps the most flavourful and moist cake that you can buy from a supermarket. It never fails to please. Delicious dark, gooey cake with a wonderful ginger tang. I would say that one cake yields 6 generous portions. Warmed and sliced thinly, topped with a scoop of creamy vanilla ice-cream, it is unbeatable. I consider this as one of the best cakes on the market, absolutely delicious. This doesn't exist in Italy so it's something I often crave. Good job they have quite a long eat by date as I like to keep some at hand. Gorgeous eaten cold or hot with custard or brandy butter. This cake has been in my life since i was a child, and I'm sure it will be in my kids life too. The taste is so nice and full of flavor. The cakes are always really moist and my personal favourite is to heat it up a little bit with some custard. Mmmm. Ginger is the one spice that I really love (I suffer when I go to the States where cinnamon seems to be everywhere!) and McVities Jamaica Ginger Cake satisfies all my cravings. It is soft and sticky and just perfect with afternoon tea. For a really special treat, try it spread with a little ginger curd .. you'll never look back. Sugar and spice and all things nice! That's what McVities Jamaica Ginger Cake is made of! You can't beat this deliciously, gooey loaf cake. The sticky texture of it makes it perfect as a hot pudding, just a few seconds in the microwave and the addition of custard and you have an absolutely amazing classic British pud. The heat enhances the flavours of spice and ginger. It truly is unforgettable served in this way. That said, an afternoon coffee with a slice or three of McVities Jamaica Ginger cake really does brighten up the day. Excellent quality at an excellent price. One loaf cuts into eight good sized slices, that's four generous servings both as a pud or cold. Once you've tasted it again, you'll wonder how you ever did without it. Thank you McVities! Would you like to write a review for McVities Jamaica Ginger Cake?